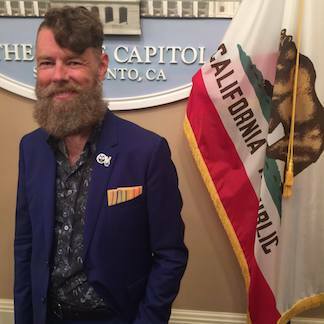 Daniel Henning, the Founding Artistic Director of Hollywood’s Blank Theatre, has been named a 2018 Pride honoree by the California Legislative LGBT Caucus. A special floor ceremony was held on June 18 during the California State Assembly floor session in Sacramento. Honorees were presented with resolutions in commemoration of their accomplishments and contributions to the LGBT community. California’s Legislative LGBT Caucus was formed in 2002 to create a forum for the state’s legislators to discuss issues that affect LGBT Californians and to further the goal of equality and justice for all Californians. Formation of the LGBT Caucus made California the first state in the country to recognize an official caucus of openly LGBT state legislators. Previous honorees represent motivated individuals in arts, law, business, and public service. They include Executive Director of Equality California Rick Zbur, journalist Helen Zia, Academy Award-winner Dustin Lance Black, and Bishop Rev. Dr. Yvette Flunder. Daniel Henning is a native Californian, born in Oakland and raised in the East Bay. He has been an activist since middle school. His work for LGBTQ Equality includes creating the 50th Anniversary Celebration of the Black Cat Protests (the first major LGBTQ demonstration in the US) and directing and hosting the 2017 LA City Council LGBTQ Pride Ceremony. Henning is a director, producer, actor, and writer. His work has been seen on MTV, HBO, CBS, NBC, ABC, FOX, and on stages throughout Southern California. He is the Founding Artistic Director of The Blank Theatre in Hollywood, winning over 200 awards for his productions from the LA Drama Critic Circle, LA Weekly, Ovations, NAACP, and more. Henning has been inspirational to thousands of young artists through his work in The Blank’s Young Playwrights Festival (the only professional nationwide competition for playwrights aged nine to 19, which he founded 26 years ago) including Tony Award-winning playwright Stephen Karam, who was a three-time winner in the Festival. Henning has written, developed, and produced many plays about the LGBTQ experience and raised thousands of dollars for Equality causes.